Responsible for almost 1.3 million deaths worldwide per year, unclean medical syringes have confounded global efforts to fight infectious diseases. As a practical alternative to invasive syringes, needle-free injectors can arrest the growing death toll and reduce significant medical waste. Responsible for the eradication of smallpox, the virtual elimination of polio, and the dramatic drop in measles mortality rates, vaccines have made a remarkable contribution to global public health. In low-income countries, however, where low sanitation is the norm, they have also been a major cause of death: The frequent unhygienic use of medical needles has led to the widespread transmission of infectious diseases. While vaccinations save two million lives per year, the unclean syringe is responsible for 30% of Hepatitis B and C infections, and 1.3 million deaths worldwide per year. Given the impressive efficacy of vaccination, it comes as no surprise that injectable medication is in high demand in developing countries. Unfortunately, however, the very countries in which injections are most necessary suffer from weak healthcare infrastructures. Such socioeconomic conditions hinder safe use, and, for a variety of reasons, needles are often reused without being sterilized. Injection equipment is often scarce, medical personnel are neglectful or insufficiently aware of the risks, and disorganized waste management prevents proper needle disposal. The full effects of needle reuse are usually difficult to identify given the lack of patient surveillance and the long latent periods of target diseases. There are, however, notable exceptions. In the 1980s, hundreds of thousands of Egyptians received a series of 12-16 injections to treat a debilitating water-borne disease called schistosomiasis. The treatments were delivered with needles that contained the Hepatitis C virus (HCV); with no cure, HCV is a leading cause of chronic liver disease. Egypt now has the highest prevalence of the disease in the world. A 2007 Egyptian government-commissioned study revealed an estimated infection rate of 10-15% in the population. Until the void in public awareness and education is addressed, governments will be unable to improve sterility standards, and such lapses in judgment will persist. To be clear, poor vaccination protocols are not unique to Egypt, as can be seen in viral outbreaks in India, Pakistan, Tanzania, Sudan, Libya, Taiwan, Romania, and Moldova. While proper disposal can eliminate the possibility of needle reuse, the destruction of medical sharps in the developing world is a highly expensive and dangerous process. To be disposed of properly, syringes must be placed in puncture-resistant, leak-proof boxes for burial in a protected pit, collection for off-site treatment, autoclaving, and/or incineration. An environmental official usually provides oversight to ensure that the syringes are never resold on illegal markets. With weak healthcare infrastructures, developing countries are understandably challenged in undertaking these efforts. The sterilizable syringe is a cheaper and more environmentally-friendly alternative to the hypodermic needle. Re-usable up to 50 times, these syringes must be sterilized in steam after each injection at a temperature of 121°C for 20 minutes. However, healthcare workers must have access to sterilization equipment and proper training since inadequate sterilization can result in the transmission of disease. On one hand, sterilizable syringes are less expensive and generate a fraction of the waste that is associated with disposable syringes. However, improper sterilization poses a huge public health threat and fails to offer enough of a marginal improvement over current hypodermic needles. Rogue needle use is to be expected. Syringes are difficult to dispose of, and their very design makes them amenable to reuse. In 1990, leading world health organizations proposed a temporary solution by devising the auto-disable (AD) syringe, which would be unusable after a complete dose of vaccine was administered. The AD syringe eliminates the black market that is associated with disposable syringes, a box of which can be sold for $30 on the streets of England. Though AD syringes may have prevented the transmission of Hepatitis C in Egypt, critics claim that they are unsustainable for a variety of reasons: excessive prices relative to those of standard syringes, the lack of needle protection, and the same array of waste disposal problems that was noted earlier. Moreover, officials fear a shortage at critical times if their supplies are never to be sterilized or reused. The injection devices that are currently in use in low-income countries are clearly far from perfect; the World Health Organization (WHO) reports that 30% of administered injections are unsafe. Safer and sustainable needle-free injectors offer a promising alternative to sterilizable and disposable syringes. Needle-free injectors (NFIs) perform the same task as syringes without the use of a needle. Instead, an NFI drives liquid through a nozzle orifice (76-360 micrometers in diameter), creating a high-velocity liquid jet that punctures the skin and delivers the drug below the skin to fat or muscle. Designed in the 1940s and since developed in a variety of forms, NFIs have been employed in a number of cases: mass immunization, insulin delivery, anesthetics, and growth hormones; and the prevention of cholera, measles, hepatitis B, and polio. NFIs offer a significant improvement over conventional syringes. Since the device lacks a needle, disposal is safe, and all of the difficulties that are associated with needle sterilization are avoided. There is no risk of needle sharing, no risk of accidental needle-sticks, and no need for a sharps container. Furthermore, some NFIs have the potential to enhance the effects of vaccination by delivering drugs to the outermost layer of the skin, where an individual’s immune response first takes effect. By lowering the required dosage for vaccination, consistent delivery to this anatomical area saves money and materials in the long run. Portability: As all jet injectors require a power source, the constraints of rural environments must be taken into consideration. The three most common sources of energy include compressed springs, compressed gas, and electricity. The Injex 30 by Equidyne is an example of a spring-powered device that is practical for low-income villages. The size of a pen, it uses disposable ampules and is prepared for injection by using a plastic “reset box” that is the size of a stapler. The Biojector® 2000, on the other hand, is powered by carbon dioxide, and has been used millions of times since its introduction in 1993. Finally, MIT’s BioInstrumentation Laboratory has designed an NFI that runs on electric power, using a magnetic switch to deliver injections. For rural settings that may lack electricity and access to compressed gas, the NFIs that rely on compressed springs for power constitute the most inexpensive and sustainable alternative. Facility: Most jet injectors use an ampule that is similar to a syringe’s plastic or glass body. If the injector is not pre-filled with the drug, health administrators should be able to fill the ampule easily from a medication vial without using a needle—the vial adapter on the Injex 30 provides a good example. The device must also be user-friendly, control of injection volumes facile, and set-up and clean-up time minimal. Currently however, most available NFIs are difficult to refill. The Medi-Jector VISION, whose display window is very small and hard to see, has to be primed before injections, a task that can be confusing and tedious. NFIs may be easily disposed of, as ampules can be collected under less stringent conditions for later recycling. However, more time and resources must be dedicated to improving usability. Affordability: With Sub-Saharan Africa’s gross national income per capita at $700-800 in 2005, the cost of NFIs is a clear consideration. 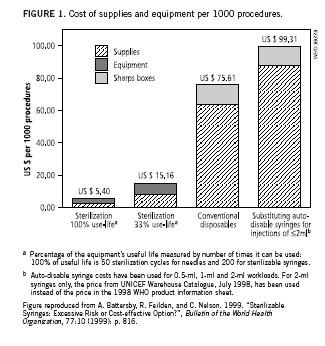 The use of sterilizable needles is by far the cheapest injection option, at $5-15 for 1,000 injections (Figure 1). Conventional disposable needles cost about $75, while AD syringes cost a little less than $100. 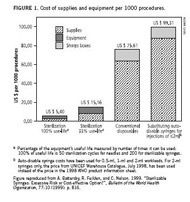 It should be noted that these costs do not include those of disposing and destroying syringes, which can add up to initial purchase costs. While they last for several years, NFIs require a very high initial investment and are likely to be too expensive: Starter kits cost between $165 for the AdvantaJet, $260 for the Injex 30, and $300 for the Medi-Jector. For 100 injections, disposable ampules cost about $50 for the Injex 30 and about $30 for the Medi-Jector. These prices are sure to decrease with widespread use and international agency support. As was seen with the advent of the transistor, however, price reductions are unlikely to occur until further technological innovation and economies of scale are achieved. Incentives for such innovation are not yet clear. Consistent Injection Volume: To penetrate the skin and achieve a complete injection using an NFI, the liquid jet of medicine must reach a critical velocity, usually around 100 meters per second. The critical velocity for penetration depends on the stiffness and thickness of the skin, as well as the site of injection. Once the skin is punctured, continued jet pressure increases the depth of the injection. If the delivered volume exceeds the size of the skin puncture, some of the medicine may splash, resulting in an incomplete or failed injection. Splashing is a major concern in vaccine administration. In the 1980s, small amounts of blood on the tip of a multi-use-nozzle jet injector (MUNJI) were implicated in the transmission of Hepatitis B. Newer multiuse injectors like the Medi-E-Jet, on the other hand, have been shown not to cause cross-contamination in chimpanzees. High Throughput: Once the cross-contamination risks that are associated with splashing are resolved, MUNJIs present distinct advantages for immunization because they reduce medical waste, costs, and administrative time. Disposable-cartridge jet injectors like the Injex 30, which are better for curative injections, eliminate contamination risks but sometimes require energy-intensive loading and preparation. It would be easier if the injection could be preset and displayed prominently on the NFI, with refilling activated by the flick of a switch. Several models that have been devised at academic research centers like the MIT BioInstrumentation Lab provide this capability. The ideal jet injector is months, not decades, away. With the support of such authorities as the WHO, which have championed the cause of safe immunization and can spread awareness about the issues that it entails, safe injectors can be distributed worldwide within the foreseeable future. If such influential groups could provide incentives for manufacturers to invest in research and development for NFIs, the cost of producing such injectors could significantly decrease, making them a feasible option for the countries that need them most. The lives of untold millions are at stake. Melis N. Anahtar '08, a 2007 Rhodes Scholar, will graduate MIT with a S.B. in Mechanical Engineering. 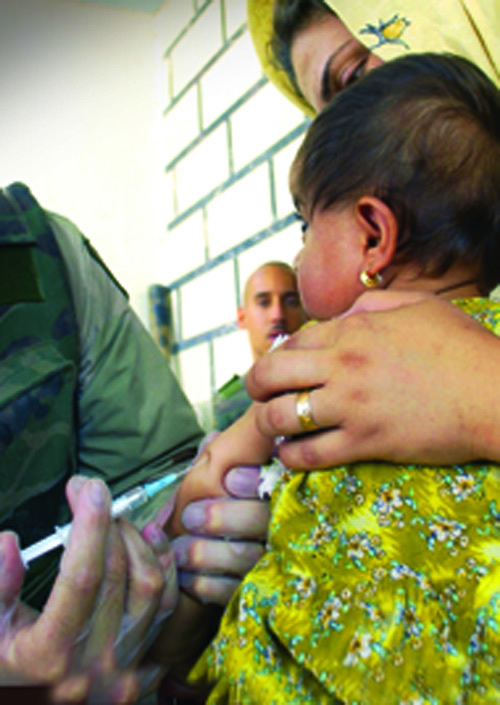 An Army Medical Specialist administers a shot to an Iraqi girl during an immunization program held in downtown Kirkuk, Iraq, in 2003. Photo by SSGT Lee A. Osberry Jr., USAF. Released to public.